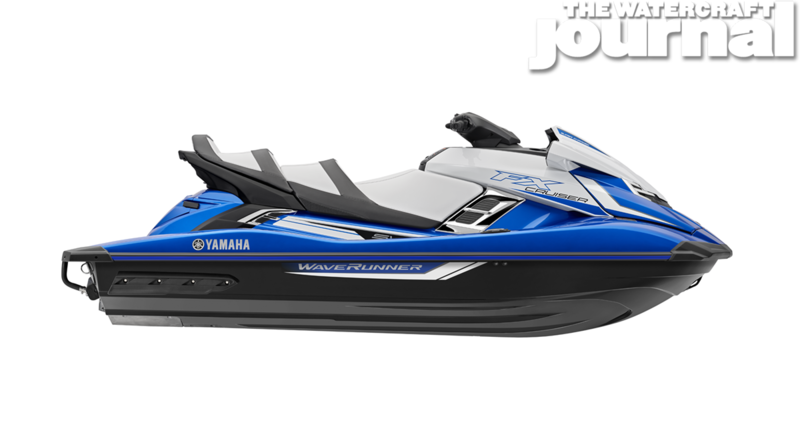 Gallery: Introducing The 2018 Yamaha WaveRunner Lineup | The Watercraft Journal | the best resource for JetSki, WaveRunner, and SeaDoo enthusiasts and most popular Personal WaterCraft site in the world! 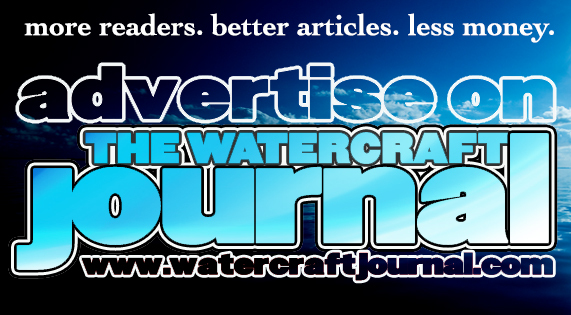 It’s incredible to believe, but not since the tipping point of 2008 has the boating and marine industry been so vibrant. 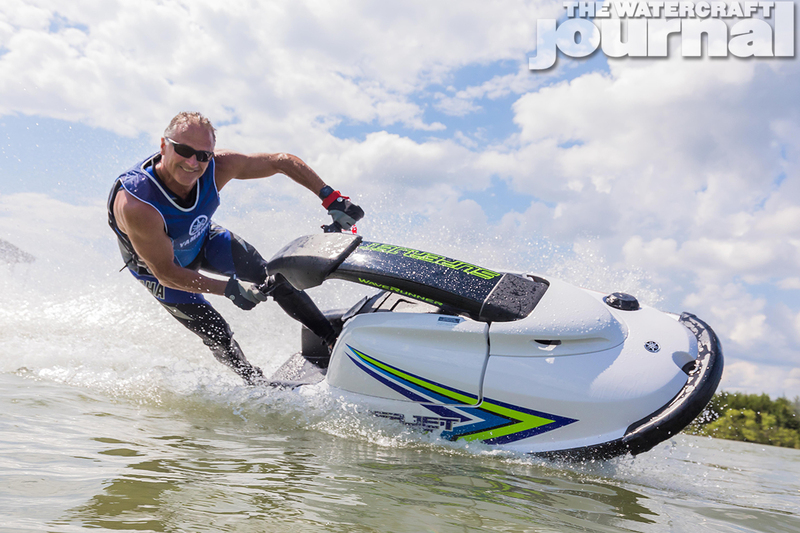 During a private meeting with the Yamaha Motor Corp. USA marine division’s top brass, The Watercraft Journal was presented with some of the most exciting and encouraging data that we’ve had the pleasure of reporting since our launch in 2013; during the past 12 months, 88 million Americans took to the water, equating to a growth explosion 3-to-4 times greater than previous projections. Of that growth in the boating market, the personal watercraft industry leapt up an incredible 11-percent in new unit sales. 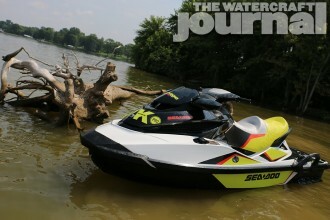 Marking that growth were gains from all three OE manufacturers: Sea-Doo picked up 6-percent in sales, Kawasaki nabbed an impressive 11-percent (thanks in no small measure to the introduction of its 4-stroke SX-R), and Yamaha, who rocketed ahead with a staggering 18-percent gain (making Yamaha the fastest growing brand). 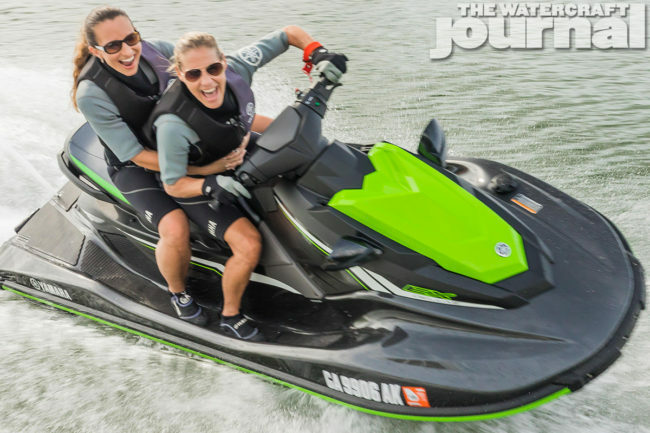 Of that impressive growth, an impressive 49-percent of new vehicle sales went to first-time buyers (Kawasaki also reported a strong 38-percent in first-time buyer sales). 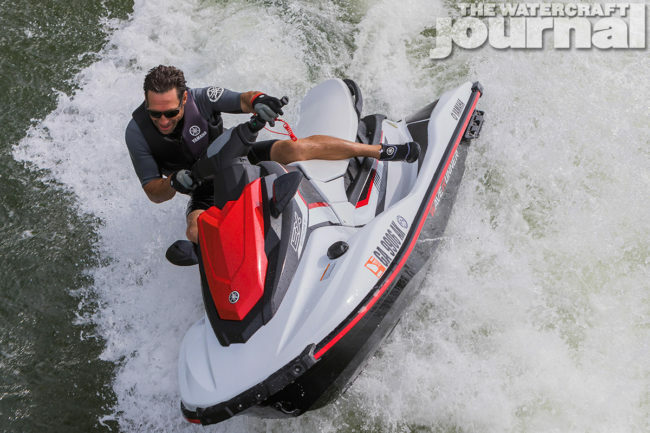 That is a percentage unmatched by any powersport market, be it motorcycles, snowmobiles or otherwise. Moreover, Yamaha’s EX Series lead the percentage of first-time buyers for the brand, while the GP1800 was praised for being the first performance runabout in the Top 10 sellers in years (fetching a respectable 6th place). 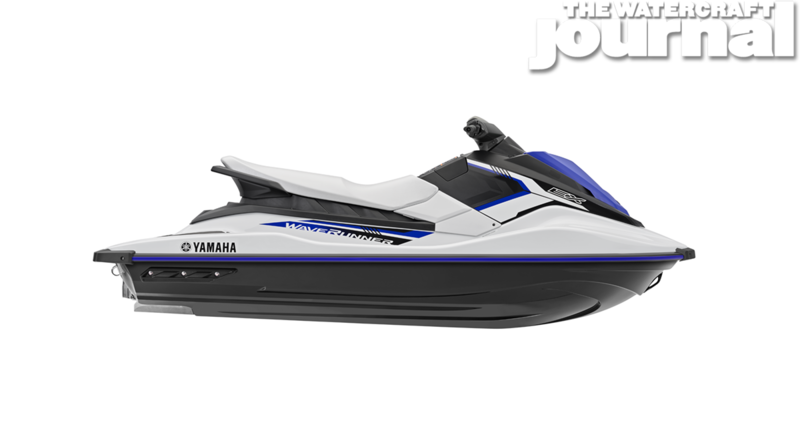 In fact, six Yamahas filled the Top 10 best sellers for 2017, with the EX Sport grabbing 3rd place in the Top 3, behind Sea-Doo’s Trixx and 3up Sparks. (Of the 130,000 estimated used PWC sales sold – across all brands – 54-percent of new EX buyers had considered buying used until purchasing a new Yamaha.) And speaking of the GP1800, the runabout out-sold the Sea-Doo RXP-X 300 two-to-one in 2017, and was one of the fastest-selling PWC on the market. At the close of 2017, Yamaha WaveRunners is looking pretty dang strong: among shoppers and current customers, Yamaha ranks highest for reliability and continues as the Number 1 choice for rental organizations for the past 20 years. 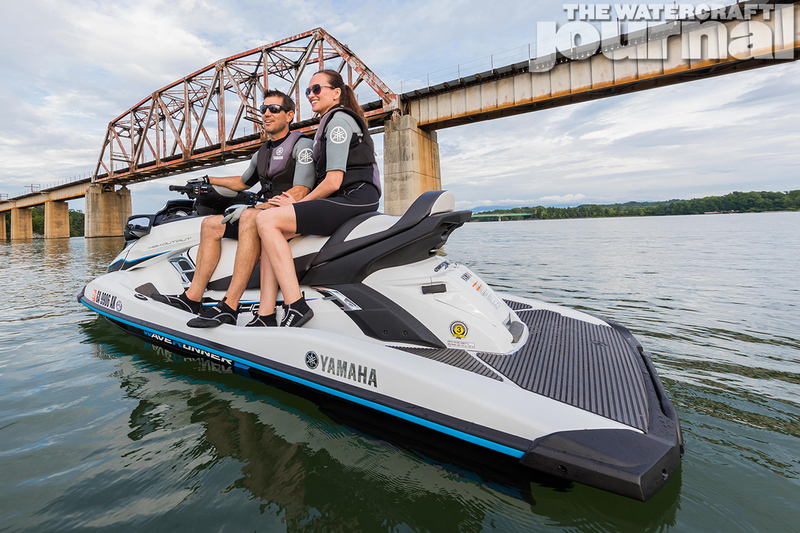 For 2018, Yamaha is marking 50 years of marine engine technology as well as the 50th anniversary of YamaLube. 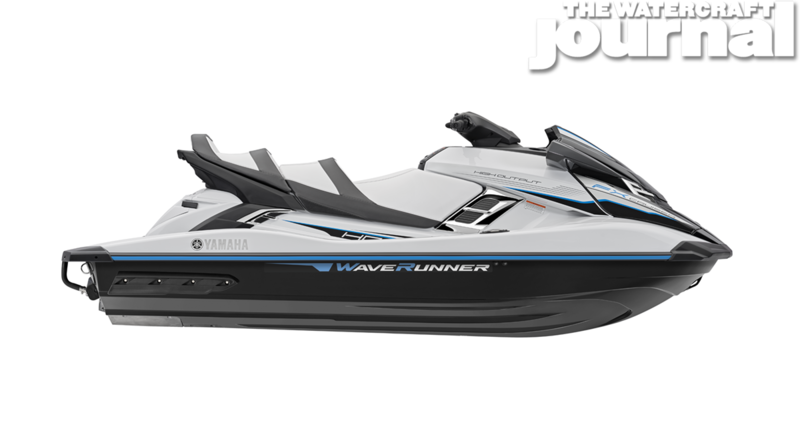 In regards to the 2018 lineup of WaveRunners, Yamaha is offering 25 models (15 if you exclude color options), all of which feature new coloring, graphics and moldings from last year. And if Yamaha needed 2018 to be any more exciting, it’s projected to produce its one millionth WaveRunner in April, which is sure to be a highly desired production number among the diehards. 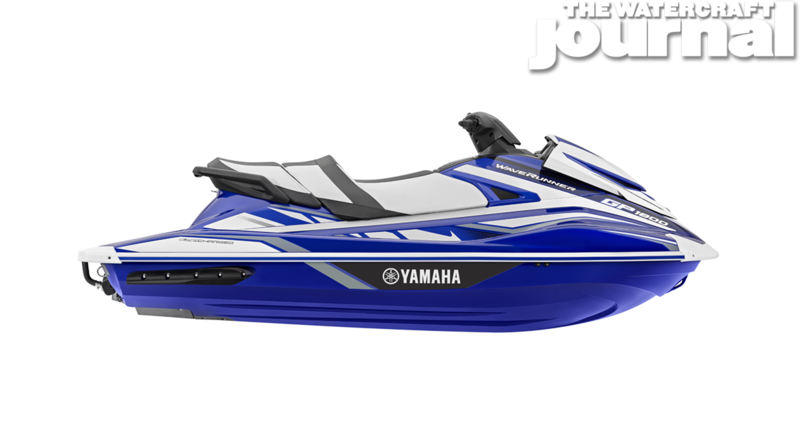 As noted, Yamaha’s Rec Lite segment entry – the EX Series – experienced a heck of a freshman year, slipping in behind Sea-Doo’s two most popular Spark models. 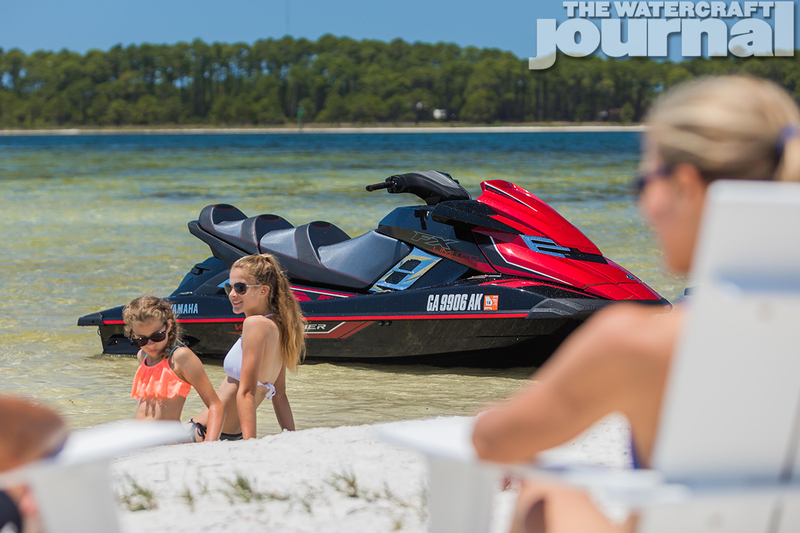 For 2018, the EX lineup remains the same; the base model EX ($6,699) is available in Pure White-and-Deep Blue, and is powered by the 102-horsepower 1049cc TR-1 EX 3-cylidner engine. The EX Sport ($7,699) ups the ante with side mirrors, a spring-loaded reboarding step and a mechanically-operated reverse. 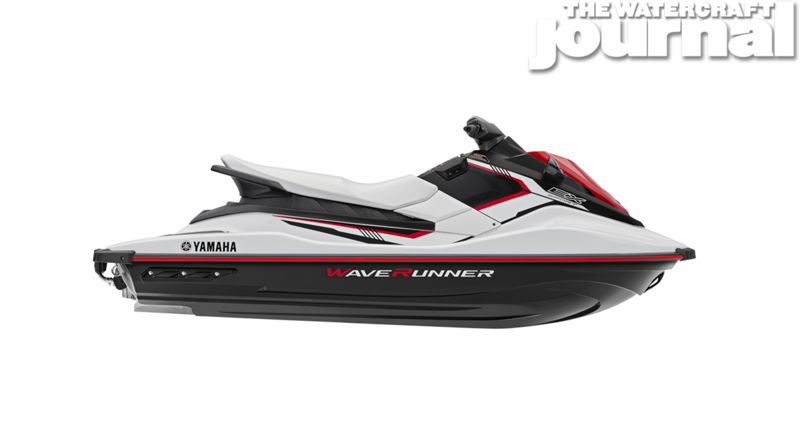 It also comes in a choice of Yacht Blue Metallic or Pure White-and-Torch Red Metallic. Finally, the EX Deluxe ($8,699) features a choice of metallic paint hues (Carbon Metallic-and-Electric Green, or Metallic Azure Blue), a two-tone “cut and sew” seat, more aggressive graphics and of course, Yamaha’s RiDE dual-throttle brake-and-reverse system. Yamaha’s best-selling segment – the VX Series – continues to offer the Recreation group the widest variety of trim, comfort and performance options. 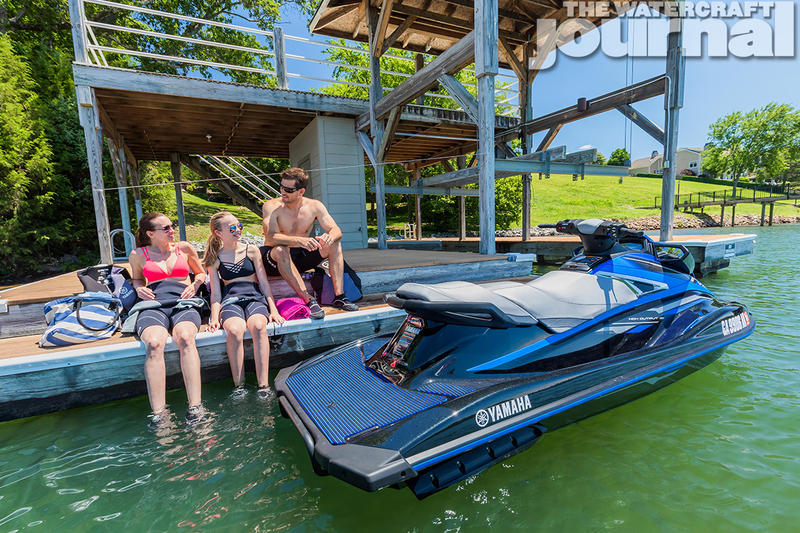 Constituting the second-largest percentage of buyers (29-percent), the VX Series offers a little bit of everything. 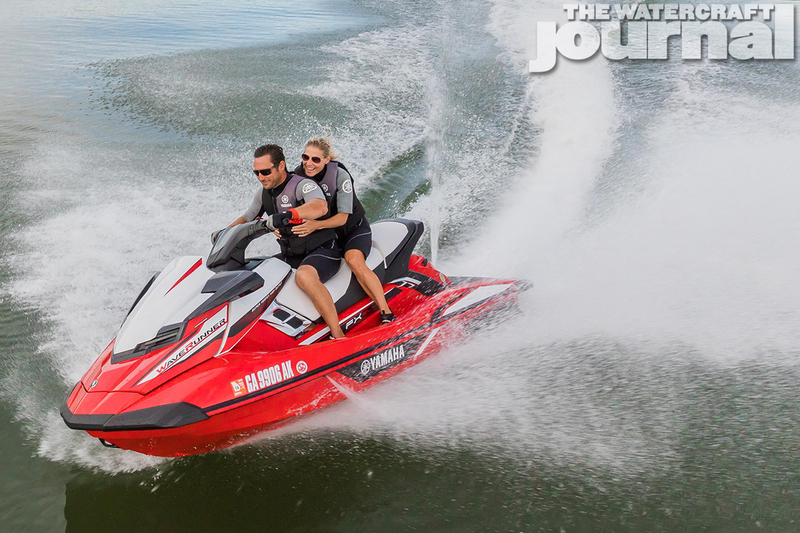 The entry-level VX ($9,599) is powered by the unrestricted 1049cc TR-1 producing an official 118-horsepower. 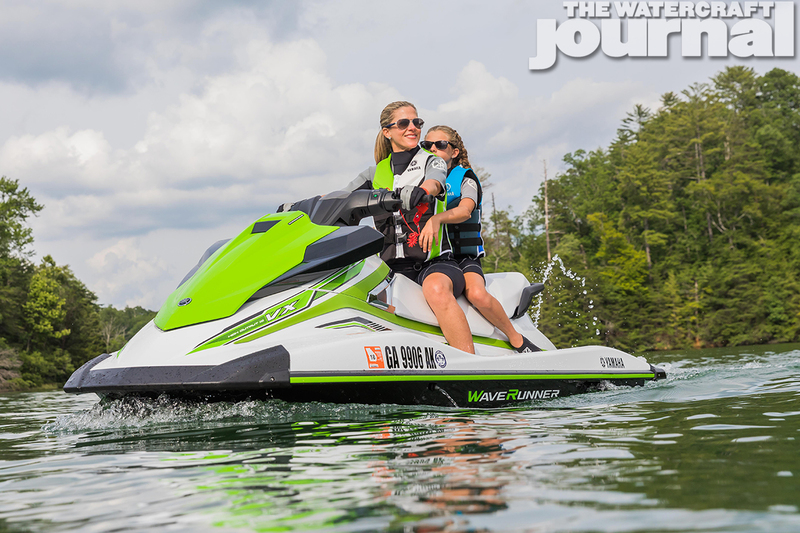 Equipped with a 18.5-gallon tank, the VX can provide hours of fun without requiring extra fuel. 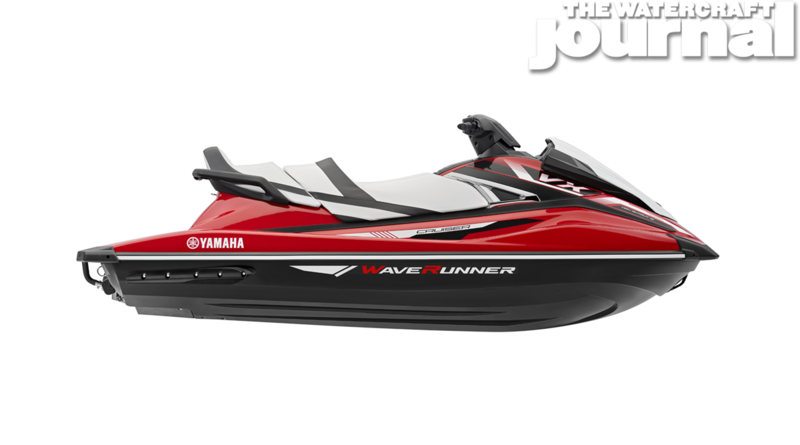 The next level up, the VX Deluxe ($10.399) remains the best-selling PWC model in history, and like the base VX and all other Yamahas, comes standard with RiDE. 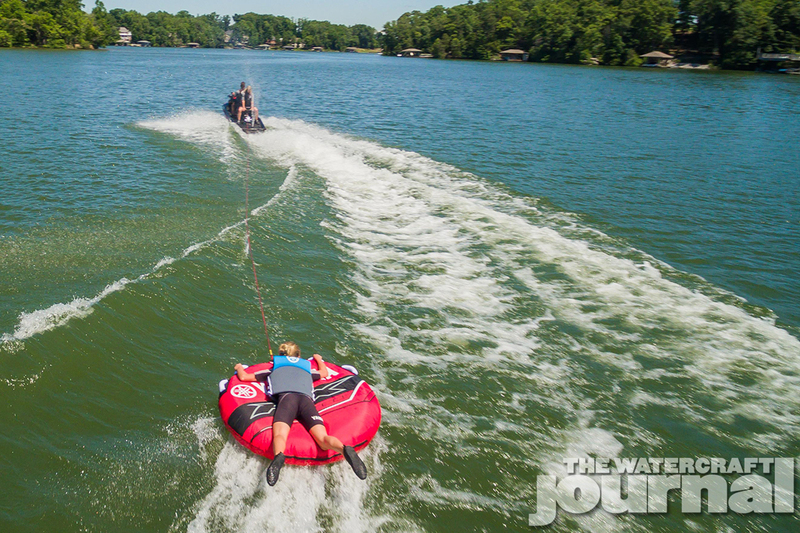 The VX Cruiser ($10,699) is equally equipped but with the tiered Cruiser bench seat. 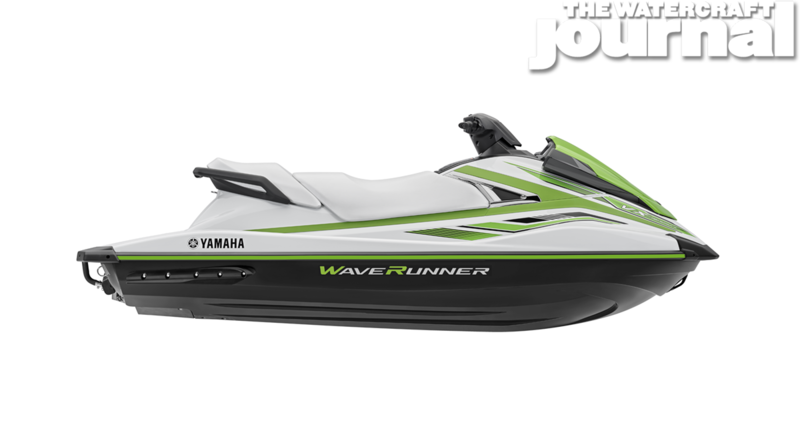 The VX comes in Pure White-and-Electric Green; the VX Deluxe comes in either Pure White or Black Metallic/Azure Blue; as the VX Cruiser is offered in either Torch Red Metallic or Azure Blue Metallic. The VX Limited ($11,099) is the most-heavily equipped TR-1 3-cylinder powered VX model including the now famously popular Limited Watersports package, which includes a one-person raft, electric inflator, custom graphics and badging, a unique PWC cover and solar panel battery tender, a 12-volt socket in the glovebox, and a color-matched tow rope – specifically Black Metallic/Crimson Red Metallic. 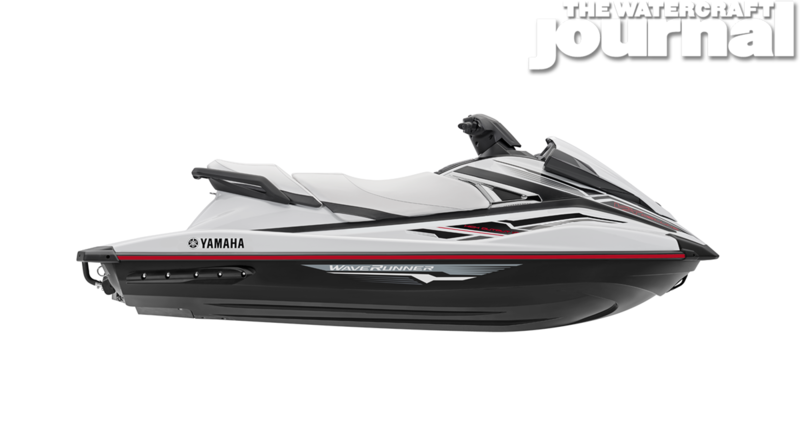 And finally, the VX Cruiser HO ($11,299) comes with Yamaha’s Cruise Assist and No Wake mode settings as well as the manufacturer’s super-successful naturally-aspirated 1.8L 4-cylinder producing 180-horsepower. Its Azure Blue Metallic-and-white or Black Metallic livery is also new. 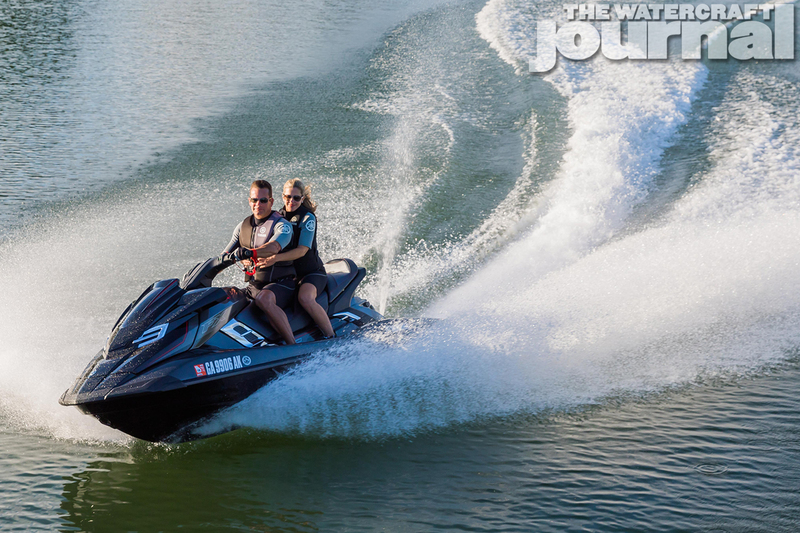 The typical Performance segment buyer equates the strongest single demographic of Yamaha sales at 33-percent. 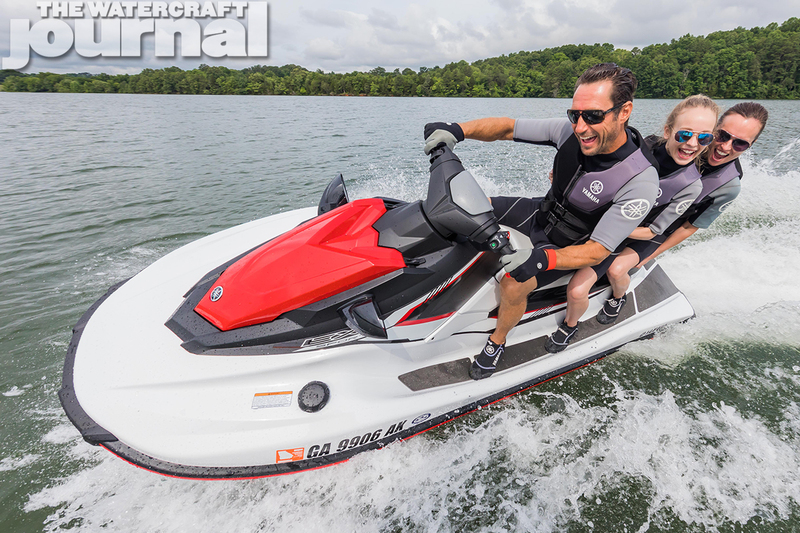 They are the youngest and most interested in overall speed, handling and performance. 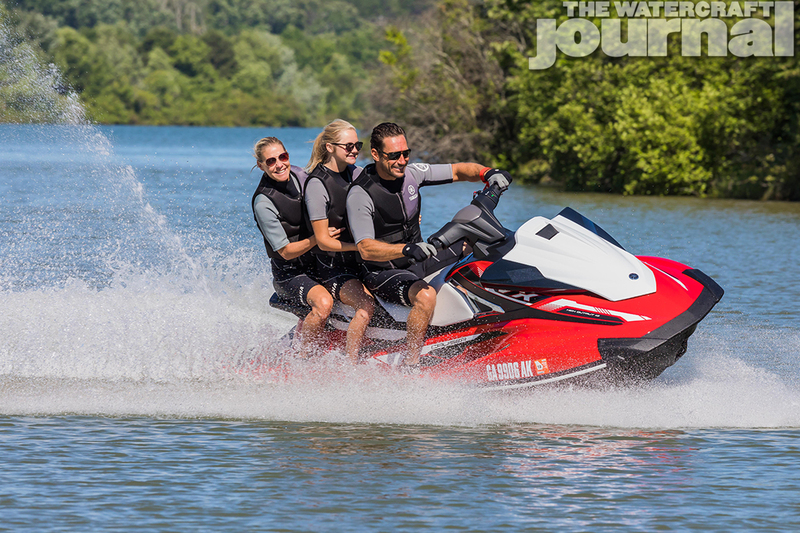 Leading this group is the GP1800. 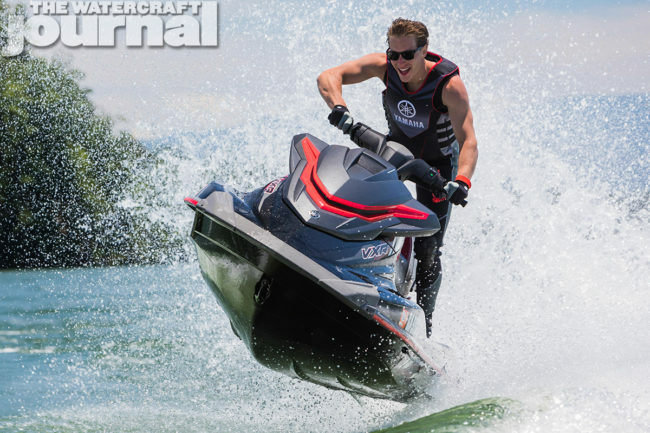 As noted, the resurrected GP model proved a runaway hit, both in sales and on the race track. 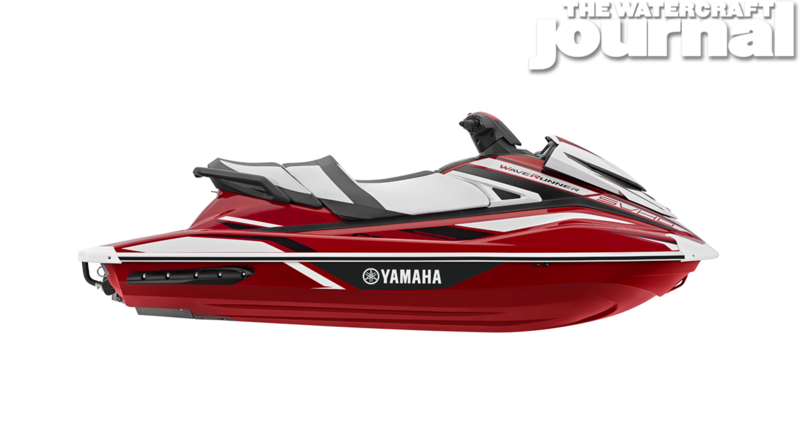 For 2018, the GP1800 ($13,999) is offered in Torch Red Metallic with white and black accents, and Team Yamaha Blue with white accents. 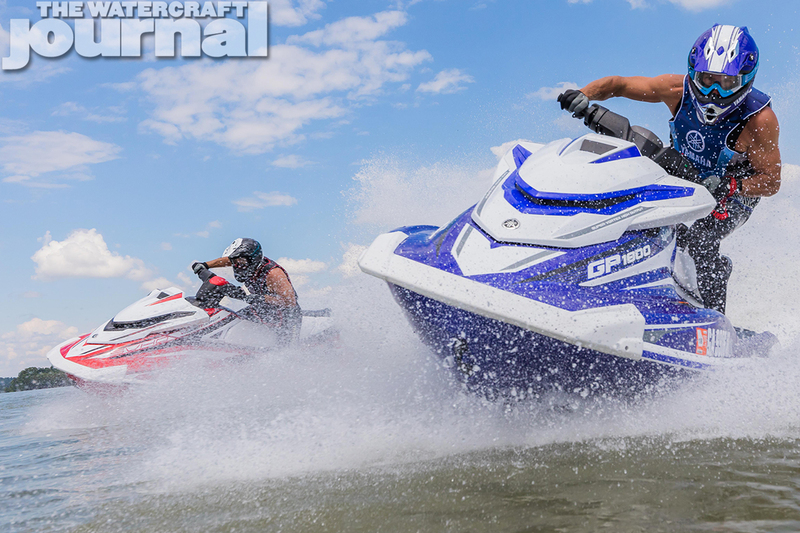 The 1,812cc Super Vortex High Output 4-cylinder did receive a single upgrade for the year: a redesigned supercharger housing. 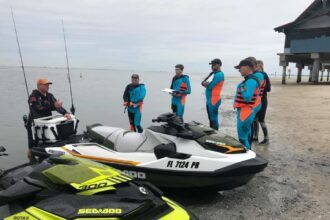 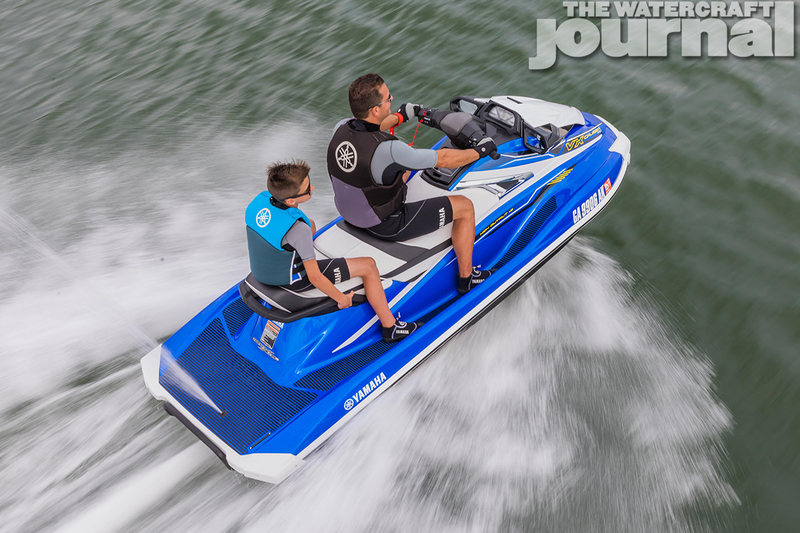 The Watercraft Journal asked Yamaha’s Scott Watkins regarding the change who explained it was one of structural and economic necessity, and that no performance gains were expected to come from the change (quelling rumors bouncing around the chat rooms). The wheel, shaft and boost level remains identical to the previous model year. 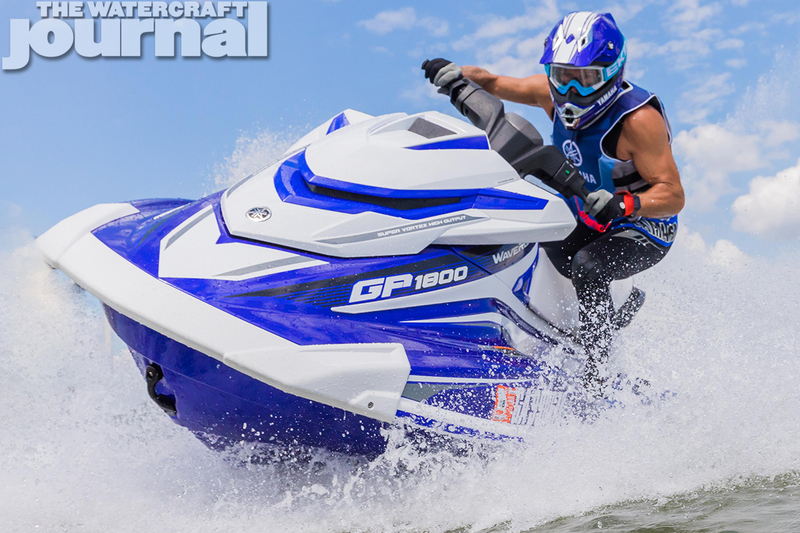 And while commenters will chide the SVHO’s officially-unofficial 250-horsepower output, the proof of the GP1800’s potency has been proven seemingly every weekend. 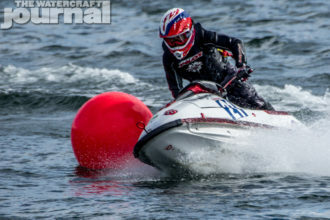 Currently, Yamaha owns a staggering percentage of moto, class and series wins, from closed course to open ocean offshore racing. 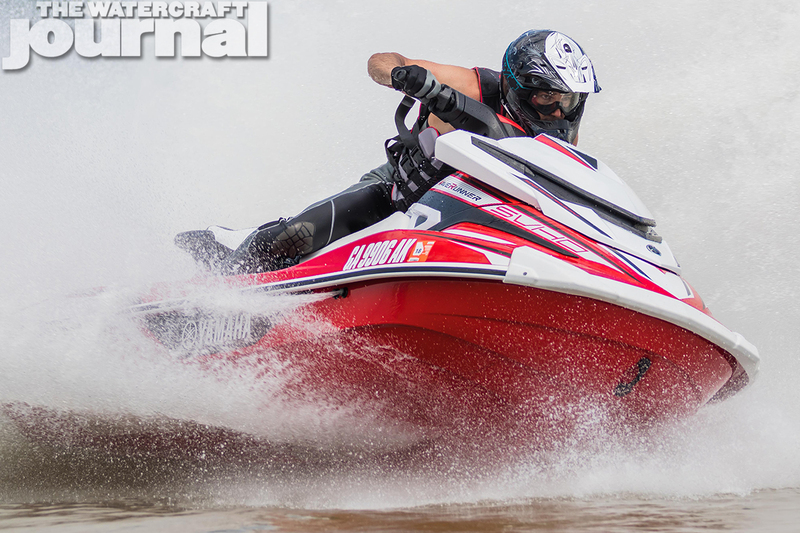 Strangely enough, the naturally-aspirated, NaneXcel-equipped VXR ($11,999) is arguably far more striking in either Black Metallic/Matte Carbon with red accents, or Black Metallic/Azure Blue Metallic than either of the two GP1800 offerings, but that is just our opinion. 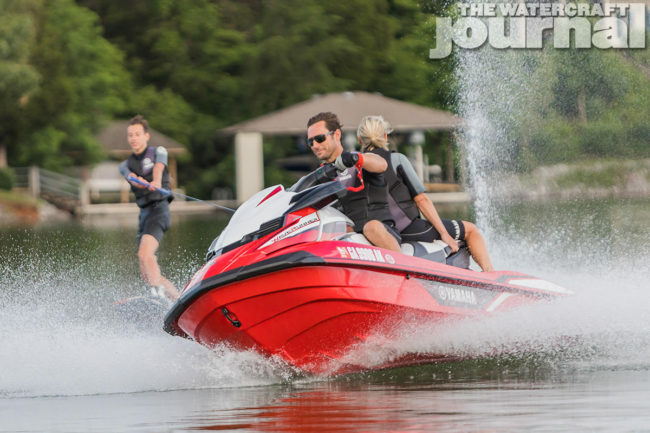 The final entry to this group is the venerable SuperJet ($8,499). In order for Yamaha to continue production of the 701cc 2-stroke, only cosmetic changes would be allowed, as per USCG regulations. 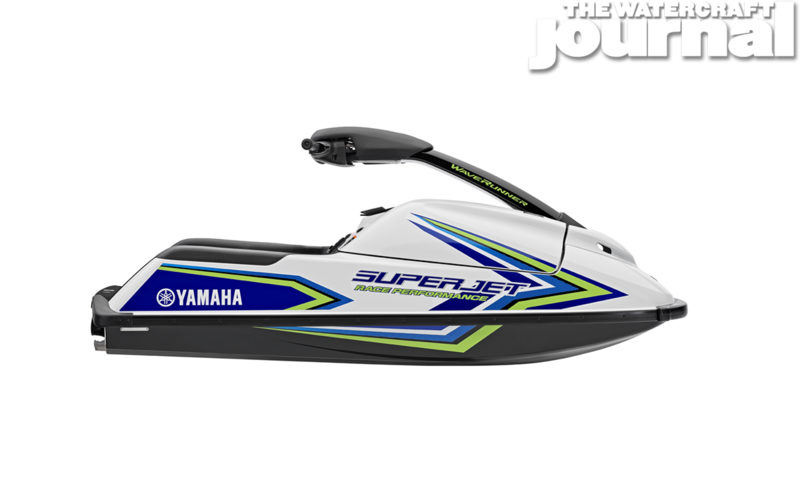 This grandfather clause has allowed the SuperJet to remain, and this year (rumored to be its final year as-is) has some very special coloring. 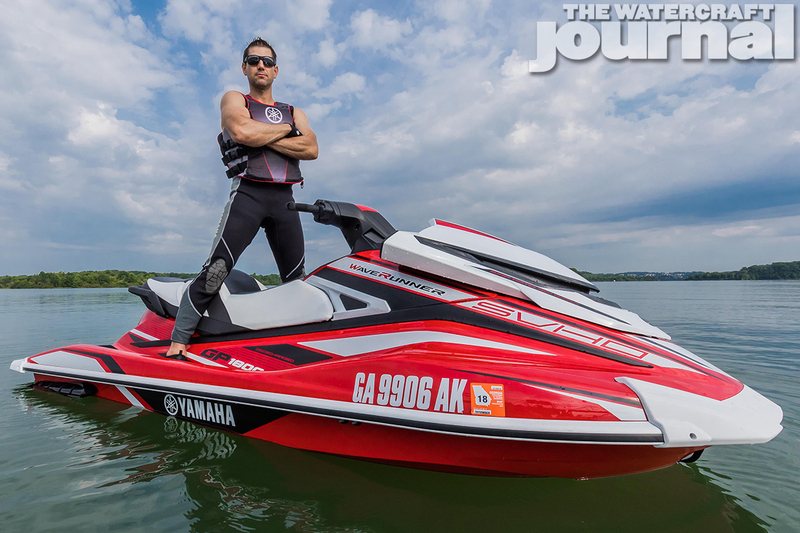 The standup features brilliant “throwback” neon yellow, electric and Yamaha-blue accents, iconic to Scott “Hollywood” Watkins’ signature wetsuits and JetPilot-sponsored skis. 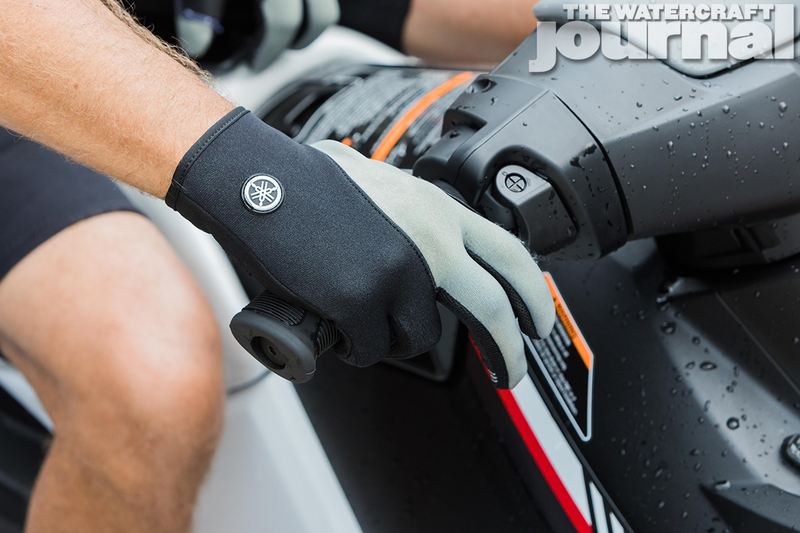 Many believe this is a nod to the long-time Yamaha Product Developer and a final send-off to the current SJ. 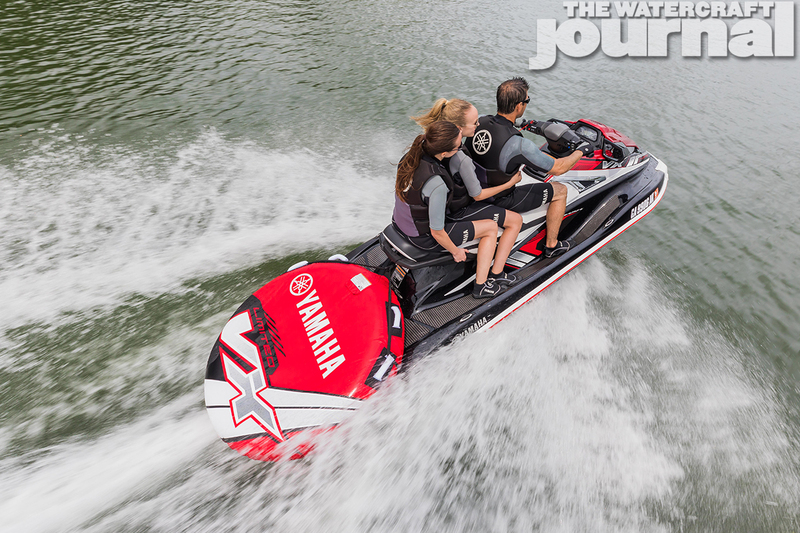 The final segment – Yamaha’s FX Series – doesn’t fail to impress, either. With the phasing out of the Super High Output engine two years ago, the FX models are split between the naturally-aspirated 180-horsepower 1,812cc plant, and the aforementioned supercharged-and-intercooled 250-horsepower SVHO. 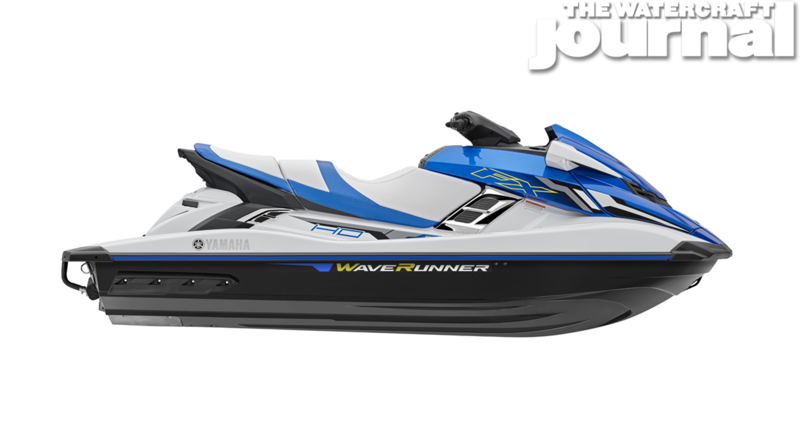 The FX HO ($13,299) and Cruiser HO ($13,799) vary only slightly, with the FX HO in brilliant Azure Blue Metallic and Pure White; as the Cruiser HO comes in a choice of Pure White with black with teal accents, or Carbon Metallic. Both include tilt steering, Cruise Assist, No Wake Mode, bountiful storage and some of the best fuel economy for a full-sized 3-seater in the market (due to the Low RPM Mode, reducing fuel consumption up to 26-percent). 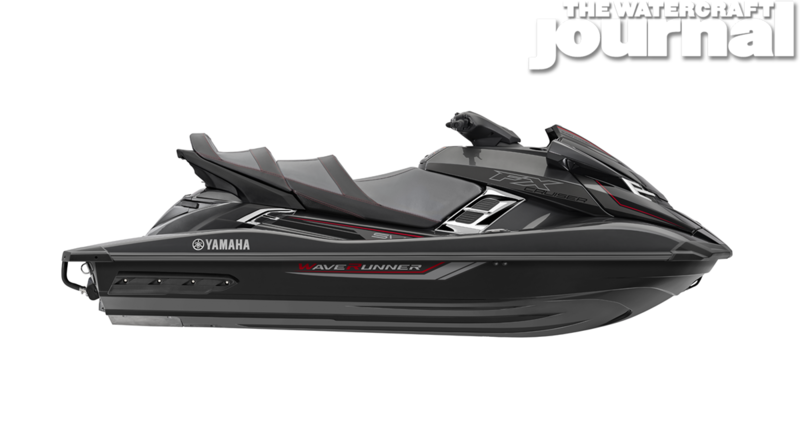 Only the Cruiser features the tiered-bench and pop-up cleats. 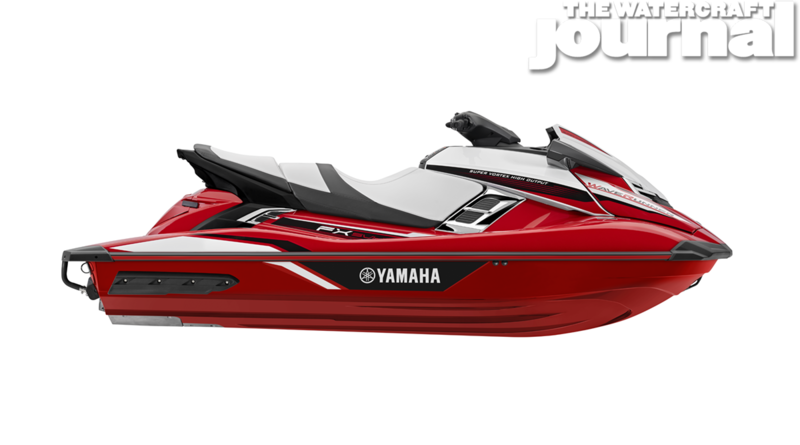 For those looking for a more exciting fare, the FX SVHO ($15,299) comes in a sporty Torch Red Metallic as the Cruiser-edition of the FX SVHO ($15,999) is offered in a choice of Azure Blue Metallic or Carbon Metallic with red accents. Similar to the naturally-aspirated models listed previously, differences include the Cruiser seat and cleats; apart from the SVHO engine and 160mm pump. Finally, the Black and Crimson Red FX Limited SVHO ($16,899) – similar to the VX Limited – comes equipped with the Limited Watersports package, including a single-rider raft, inflator pump, matching PWC cover and solar panel battery tender, a 12-volt socket in the glovebox, and a color-matched tow rope. 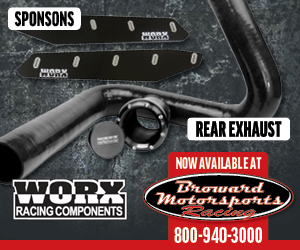 [All 2018 prices have been added to the text – Ed.] 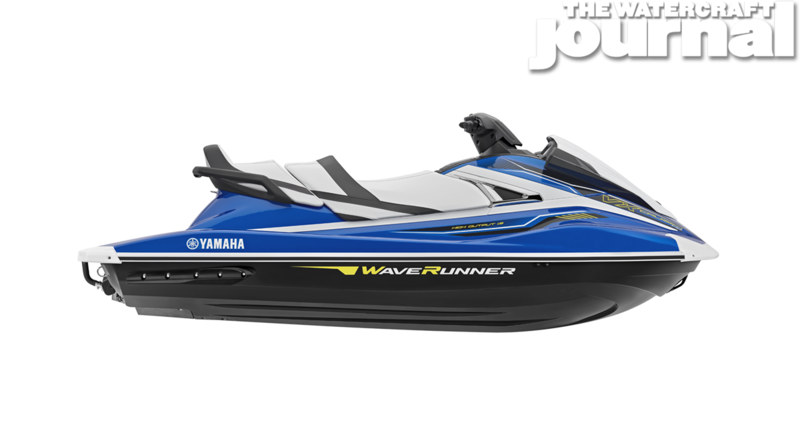 Unfortunately, new prices for 2018 were not disclosed to The Watercraft Journal at the time of this writing, but are expected to be published on the Yamaha WaveRunners website after 8pm EST, August 28th, 2017. 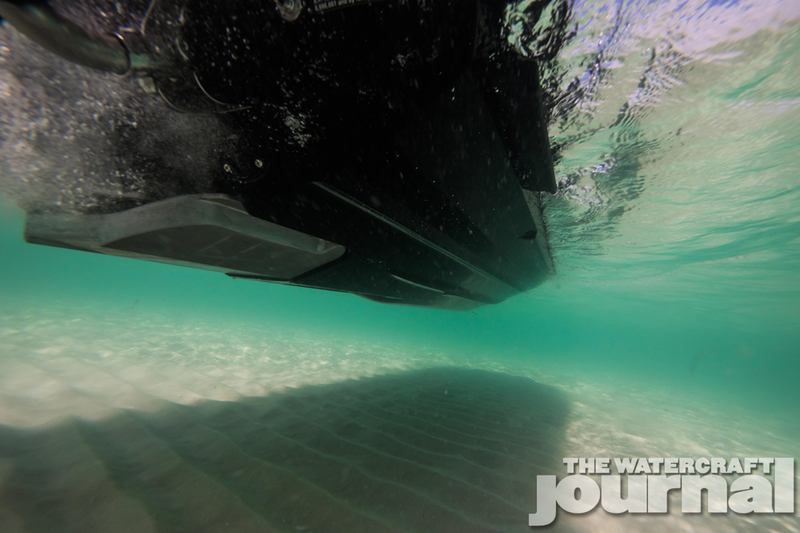 Until then, enjoy the slideshow below and remember to leave any comments or questions at the end of this report. 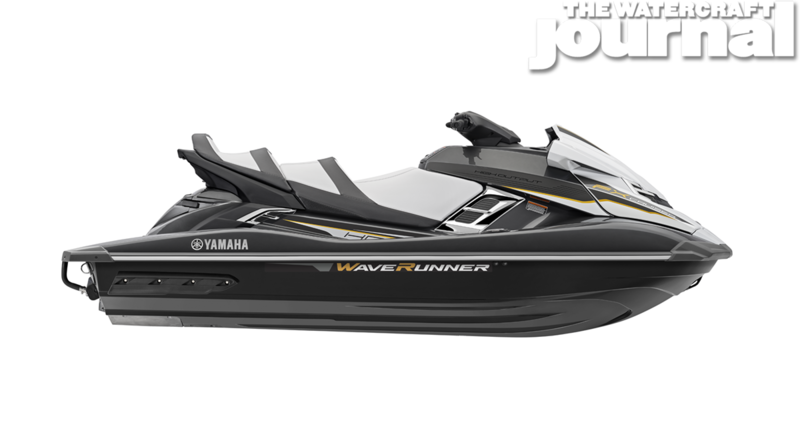 The 2018 Yamaha WaveRunner Lineup Is Coming! 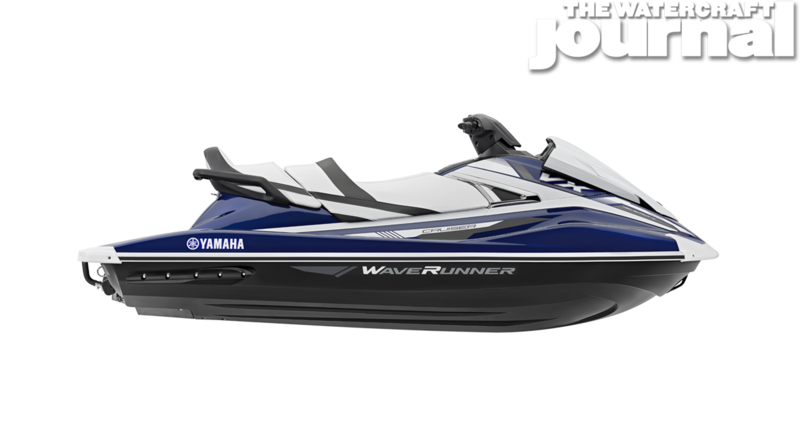 The 2018 Yamaha WaveRunner Lineup Is Coming!